Over the years, we have amassed a vast collection of archive cine-film from a variety of owners. Quite a lot has been used in our volumes but there is still considerable footage that remains unused and unseen because it either did not fit in with the “story theme” of our volumes or we were unaware of the locations. It is a shame to think that so many these clips could end up being lost and never seen. To help prevent this, our series of “Miscellanies” has been compiled from this footage and are assembled as found, leading to very interesting results! This volume features an intriguing mixture of electric and diesel action, including some EMUs and DMUs. There is no particular date, order or location of the scenes, so prepare for the unexpected! Just some of the diesel types seen include Deltics, Warships, Westerns, Hymeks, Peaks, Class 50s, BRCW type 2s & 3s, EE type 1s, 3s & 4s and Brush type 2s & 4s. There are a couple of scenes with the ill-fated Claytons in action. The Western Blue Pullman is glimpsed as well as a number of HSTs. Electric traction covers Electro-diesels, EM1s & EM2s in action over the Woodhead route, Classes 83, 84 and 86 on the WCML, many in original livery and in pre-TOPS days. Multiple unit operations include the famous Brighton Belle, as well as vintage 502 units on the Liverpool lines. We also see Southern Electric EMUs in operation and a variety of DMUs including Trans-Pennine units, and Gloucester single car units. 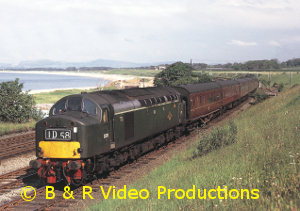 Plus a few scenes of GWR railcars in action. Locations featured are from all over the UK , from Wick in the north to Southampton in the south, from Penzance in the west to Manningtree in the east. And almost everywhere else in between! Many locations are now long gone; there are others that we have been unable to identify, so you will no doubt have great fun in trying to establish those places yourself. You will be able to enjoy passenger and freight operations, as well as special charters. Pullman and Royal trains are also included as well as an accident at Great Chesterford involving D6729 and lots of new cars! Most of the scenes were filmed between 35 and 50 years ago. Many of the locomotive types featured are no more; neither is much of the rolling stock and even the infrastructure in many cases is now long gone. We are sure you will enjoy this film, especially if you enjoy the unexpected, so do look out for others in this series, including those concentrating on steam. All archive film is in colour except for one scene at Liverpool Central. Authentic sounds have been added together with an extensively researched and informative commentary. Cover photo:- Keith Pirt/Courtesy Book Law Publications. EE Type 4 D370 between Abergele & Colwyn Bay, July 1963. This entry was posted in Diesel & Electric Miscellany Series, Diesels & Electrics (heritage), Miscellany Series (post Vol.190), Volumes 200-206 and tagged archive, Blue Pullman, diesel, electric, freight, Gloucester, GWR, Keith Pirt, Liverpool, Southampton, steam, traction, WCML. Bookmark the permalink.